Can't say much more about this company and product. Best company in the industry. Love how these steel water bottles are made out of recycled materials. They were a big time hit at my latest event. All of CEP products are 100% eco-friendly and biodegradable. Big time hit at my annual event the other month. Highly recommend this company! All products are 100% eco-friendly and biodegradable! These stainless steel reusable water bottles were a huge hit at my companies event! Thank you Custom Earth Promos! Ordered 20k for my department store they are my #1 selling bottle. We wanted to give potential clients something that would be used everyday. They were a big hit! Thanks Cory with Custom Earth Promos. I like that the steel water bottles are made out of recycled material. A very eco-friendly, safe bottle. Two thumbs up on being BPA free!! I Use it everyday, thank for an awesome product! A convenient bottle that withstands the test of time. The design team at Custom Earth Promos really went all our on this campaign. We created a great looking bottle. I ordered 500 of these stainless steel water bottles for our venue. People were taken back at how classy and sturdy they were. A knowledgeable and attentive group at Custom Earth Promos. Thanks for all the help. A huge hit at our trade shows. I great way for us to market ourselves and be earth-friendly. They really came through in the clutch. I needed my order in a short time frame and Custom Earth Promos delivered. Our hiking team really appreciates the durability of these Eco-friendly water bottles. In sustainable style, Custom Earth Promos presents the Brushed Stainless Steel Reusable Water Bottles collection. A bold imprint area of 8.5" W x 3" H provides a distinct canvas, ready to be painted with the logo or campaign message of your "green" brand. You'll work directly with one of our in-house design experts to build a custom graphic for the imprint area, which can be applied using either silk screen or heat transfer printing, which is a four-color process to ensure vibrant rendering. BPA-free, stainless steel product construction guarantees safety for both the environment and your customers. Increase eco-friendly visibility, build recognition and earn the loyalty of your customers with an exclusive design of Bushed Stainless Steel Reusable Water Bottles. Spearhead your next campaign or build the eco-conscious value of your brand with a product you can be proud of! Our planet is facing a great burden of pollution and excess waste, caused by the daily overproduction of plastic water bottles. Just to produce the 29 billion water bottles consumed by America each year, manufacturers use 17 million barrels of crude oil. That's enough fossil fuel to keep a million cars running for a full year. If you were to fill your water bottle up about ¼ of the way, that's how much crude oil was burned to produce it. Scary, right? What's scarier is that as a society, we've been slow to respond to the planet's SOS. Plastic bottles have been filling up our landfills, lakes, oceans and rivers for years. Large patches of garbage, spanning for miles, exist in both the Pacific and Atlantic Oceans, with plastics taking up at least 5.1 kilograms per square kilometer of ocean. In a time when your customers are more aware, interested and invested in the social and environmental foundations of the brands they purchase from than ever before, help the planet and your business with an exclusive design of Brushed Stainless Steel Reusable Water Bottles. Encourage your demographic to stand with you in support of sustainability by limiting the amount of plastic waste they create. Custom Earth Promos' eco-friendly water bottles are a safe and stylish way to assert your eco-awareness. Boost your eco-friendly brand visibility, recognition, and loyalty with BPA-free, reusable water bottles. Perfect for promoting eco-responsible initiatives and building brand value, stainless steel water bottles are a safe alternative to plastic. Custom Earth Promos' Brushed Stainless Steel Reusable Water Bottles feature an innovative spout top which seals with a flip-top closure for convenient sipping. The entire cap comes off, making the eco-friendly bottles also conveniently accessible and easy to clean. Disposable plastic water bottles pollute our environment and contain BPA, a cancer-causing agent. Secure the safety of your customers and the sustainable future of our planet by taking a stand for sustainability. 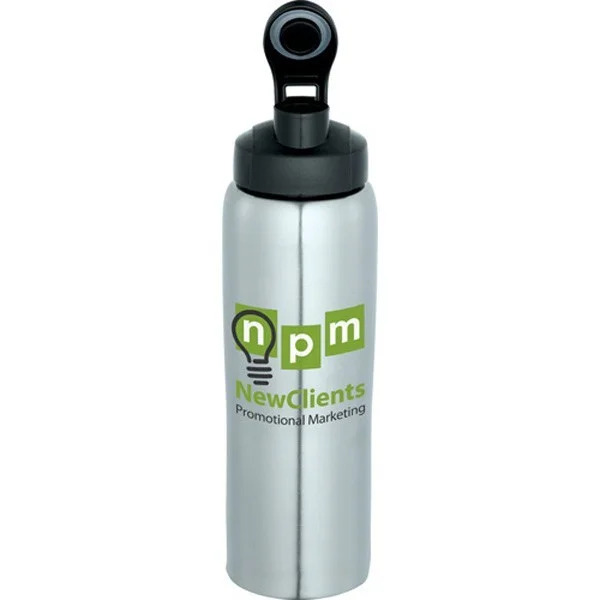 Promote your eco-friendly initiative with a custom design order of Brushed Stainless Steel Water Bottles to increase brand awareness, recognition, and loyalty. The available imprint area of our stainless steel water bottles is 8.5" W x 3" H, an impressive chunk of product real estate. Use this fully customizable field to promote your business name, logo, campaign slogan or eco-friendly initiative. Your Custom Earth Promos design expert will introduce you to our virtual spec platform, inviting you to test the waters of your design. Arrange your logo and other custom graphics on a virtual sample to see which layout and image choices best reflect your brand's design and campaign goals. Consult with your design expert for any clarifications or simply to get a professional opinion. We'll make sure your final design blueprint is everything you hoped it would be, boasting BPA-free benefits and a beautiful design that will help to save our planet while boosting your business!